- Excerpt from an interview I did with Scripts n’ Scribes online magazine. You can read the full interview here. Venue: Prime Studios, 1-6 Ward Royal Parade, Alma Road, Windsor, SL4 3HR. On the 23rd-24th of September, Prime Studios will open its doors to the public! 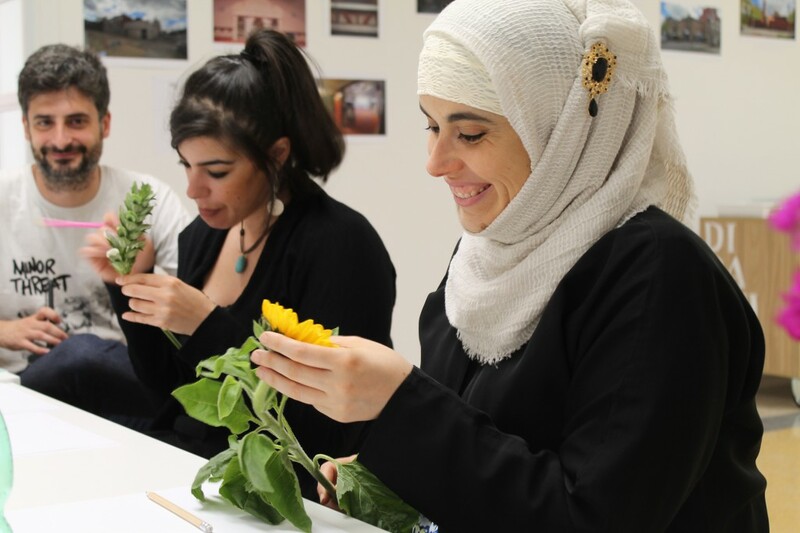 There are currently seven artists in residence, ranging from a musician and composer, to oil painters, an Islamic artist, 3D printing and more. Come visit us, see us at work, buy direct from the artists, and enjoy the the opportunity to get a glimpse into our creative spaces. 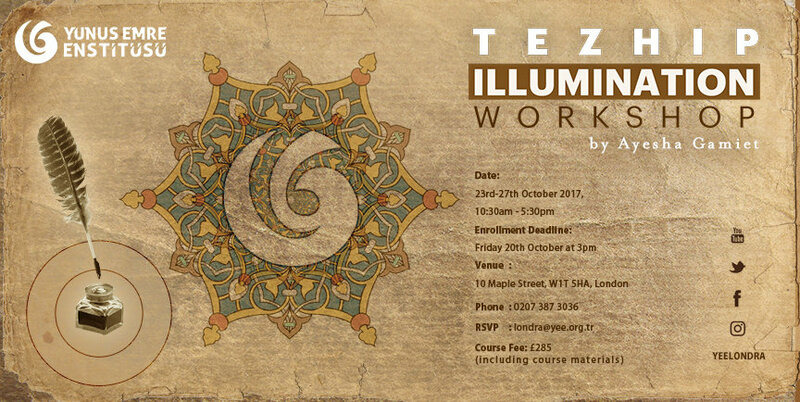 I will be giving a live demo of my illumination work, so if you’ve ever wondered how it’s done, here’s your chance to find out! I will also bring cake. What’s not to love? All welcome, please spread the word! Earlier this year, I was in Istanbul working on a very special project. For over 10 years, I have been working towards a traditional apprenticeship in tezhib (the art of Islamic manuscript illumination). The Turkish and Arabic term given to this qualification is ijaza, meaning “permission”. It is a term that exists not just in the realm of Islamic art, but also in the world of traditional Islamic scholarship and learning. Receipt of an ijaza authenticates a student’s studies, signalling the completion of their apprenticeship, indicating that the student has obtained a successful foundation and understanding of the subject in question. It gives the novice permission from a Master, or Shaykh to pass on the knowledge, and teach. 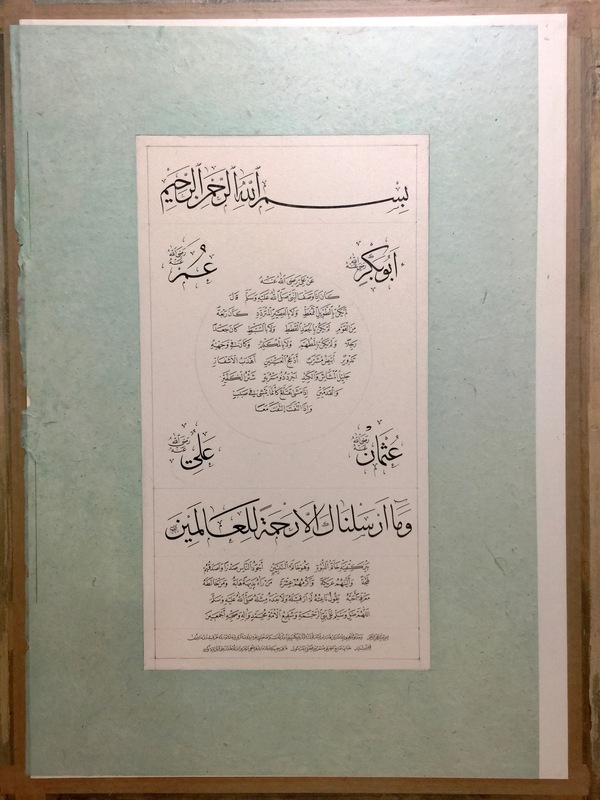 And in the case of traditional Islamic art, the ijaza graduates the apprentice to the role of fully fledged artist by giving them permission to sign their name on a piece of work. In Istanbul in March 2017, I received ijaza from my Master. As far as I am aware, I am the first British person to receive such a privilege, and perhaps the first non-Turk, too. 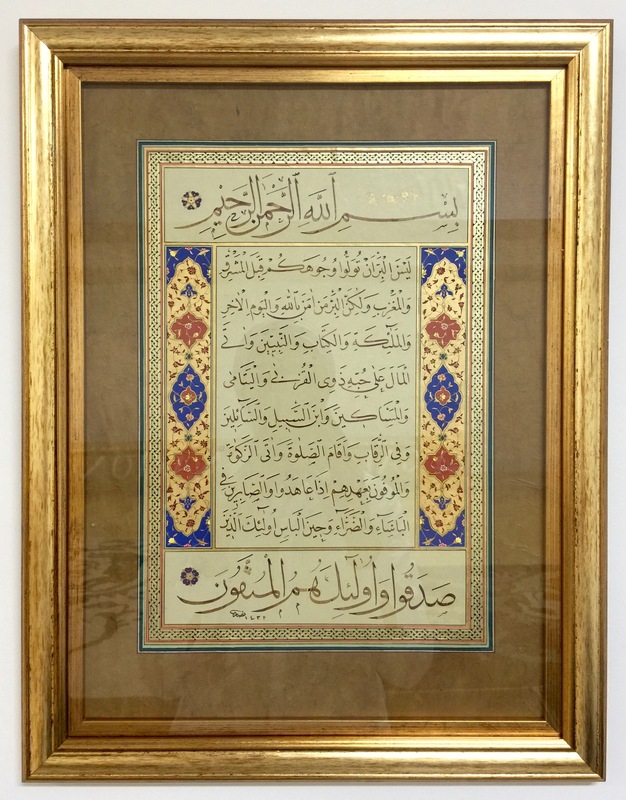 In the art of tezhib, the ijaza takes the form of a hilye – a traditional Ottoman calligraphic composition describing the physical, moral, and spiritual characteristics of Prophet Muhammad (peace be upon him). For more information on the hilye, it’s history, significance, composition, and translation of the text, I recommend this excellent article by acclaimed American calligrapher, Mohamed Zakariya. You can also take a look at a previous post I wrote about illuminating my first hilye, and the process that went into creating the artwork. 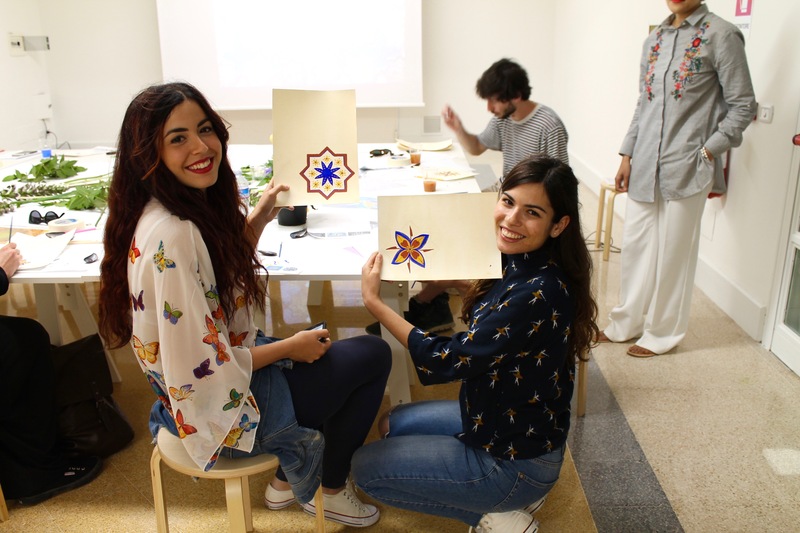 The centuries-old practice of ijaza in traditional Islamic art denotes the importance of the personal, face to face relationship between student and Master. 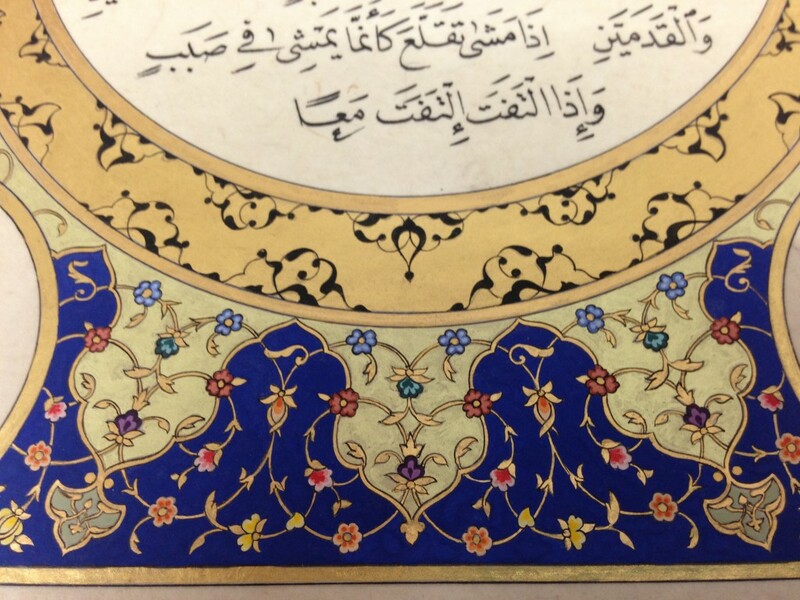 In Ottoman times, apprentice illuminators would belong to a guild of artists, where their training in the craft would go hand-in-hand with their moral and spiritual development. Although the guild system no longer exists in many parts of the Islamic world, practical craft skills, and the essence of the art are still alive. By “essence of the art”, I mean the spirit in which these works are created, and by that, I mean a spirit of humility and devotion. 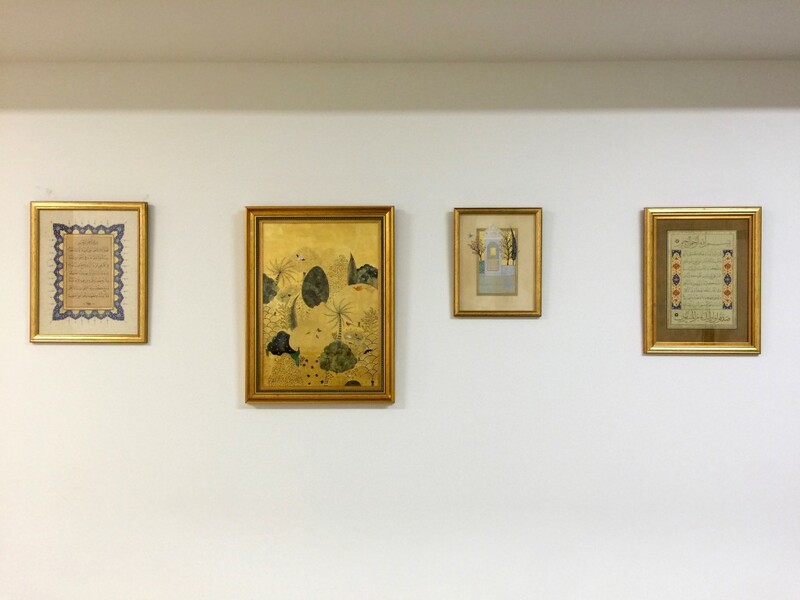 In contrast to much of the contemporary art scene, traditional Islamic art aims to place the Creator, and not the artist, at the centre of the work. Learning a traditional Islamic art, therefore becomes a process of surrendering to the discipline of the craft, as opposed to exploring individual creativity. From an Islamic perspective, there is only one true Creator, and role of the traditional Islamic artist is to glorify Him through our craft. Looked at in that light, the relationship between Master and apprentice becomes a key part of the ijaza process. More than just a teacher, the Master is more like a mentor, sharing not just their craft skills, but also the example of their character and behaviour. In my experience of learning the art of tezhib, I would say that I was initially attracted to the art by the exquisite beauty of the manuscripts. Upon meeting the illuminators and calligraphers of Istanbul, I was overwhelmed by their kindness, humility, love, and devotion to their craft. Over the years, I came to realise that this art form is not merely concerned with creating beautiful images; more significantly, when practiced with the right intention and in the correct spirit, traditional Islamic arts allows us the opportunity to craft beautiful human beings. This simple truth is what has kept me in love with Islamic art after all this time. I’m often asked why I don’t teach online courses. To me, the significance of the student / teacher relationship in Islamic art is so important that I wouldn’t feel right in compromising any part of this process. Aside from practical concerns of not being able to correct a students’ work in an online class, tezhib to me is so much more than just teaching a few painting techniques and processes. Students need to experience the face to face relationship with a teacher, to observe their character, behaviour, and temperament, to appreciate the atmosphere of the classroom, and to interact with other students. In my opinion, all of these elements are just as significant as practical skills in learning the art of tezhib. While I understand that it’s difficult to find good, authentic teachers in many parts of the world, I also know that we need to strive and make an effort for what we love. The reason it’s taken me over 10 years to receive my ijaza is not just because I’m slow! Many years have gone by when I’ve not had the time or the finances to enable me to travel to Istanbul and learn. But I persevered regardless because this art is worthy of our best efforts. And even if it had taken me 20 or 30 years, it would still be worth it. Trust me, I should know! Another crucial aspect of the ijaza is the permission it grants the novice in graduating them to the rank of fully fledged artist and teacher. Making the ijaza a mandatory requirement before teaching the art ensures that the quality of the craft is preserved through the generations. Many years ago, I received permission from my teacher to run workshops in tezhib at a very elementary level. Up until this point, my teaching has only touched on a few basic principles. The in-depth teaching of the craft is something I would never attempt without an ijaza. At best, this would be considered misguided and presumptuous, and at worst, it would show arrogance and a lack of respect for the craft and its teachers. Students who set themselves up as teachers after taking a few short courses damage the craft because they pass on incorrect and incomplete knowledge. This in turn denigrates the art, promoting bad practice, and causing the quality of work to diminish over time. The ijaza system protects against this by setting a benchmark of practice, thereby preserving the quality of the art from generation to generation. 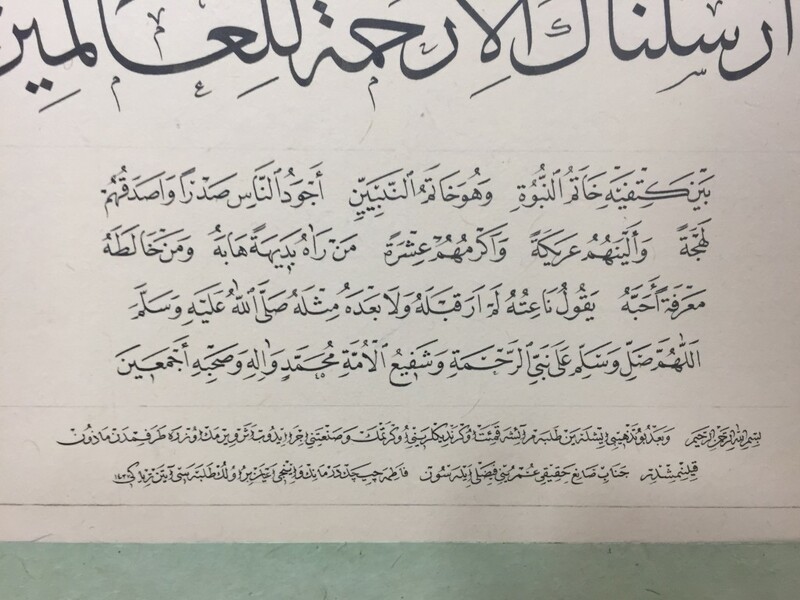 I will end this post with a close up of the ijaza text on my hilye. 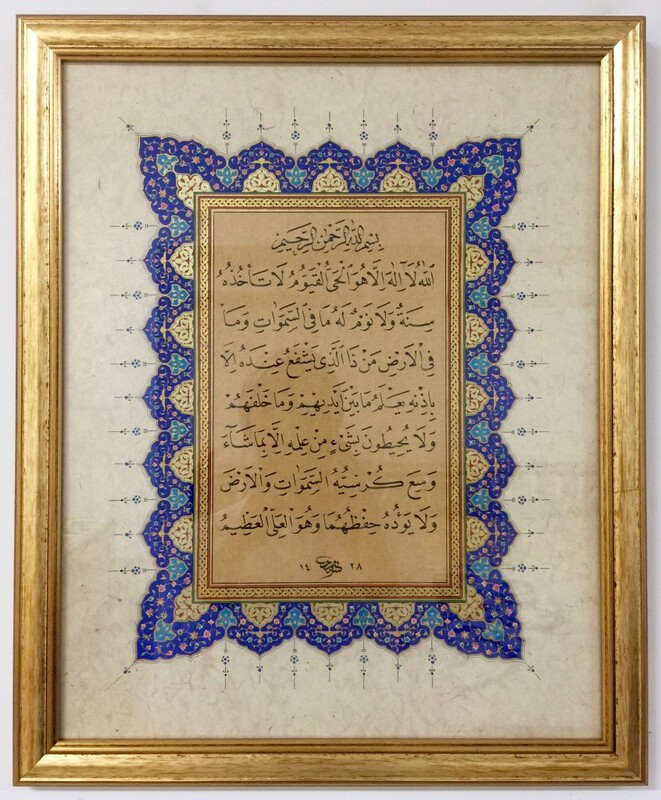 Unfortunately, I don’t have a direct translation of the Ottoman Turkish, but I can tell you that it authenticates me as a fully fledged artist and teacher in the craft of tezhib. It gives me permission to pass on knowledge of this craft, and it mentions my name, my teacher’s name, and the names of my teacher’s teachers. This last part is significant because it connects me to generations of tezhib artists, spanning hundreds of years. And that’s the essence of ijaza – the artistic and spiritual connection that it embodies, and the responsibility that falls upon each generation of artists to practice and pass on the knowledge in that spirit of humility and devotion. Last month, I was invited to exhibit four of my paintings at La Galleria Nazionale in Rome. This exhibition occurred alongside a month-long series of workshops and events with Una Moschea Per Roma, during which I delivered an Islamic art workshop at La Galleria with my friend and colleague, Shaheen Kasmani. I’ve written more about the workshops in my previous post. For more information about the project, take a look at Una Moschea Per Roma’s page. Here are a few images from the exhibition, enjoy! 'One Song' (c) Ayesha Gamiet 2017. 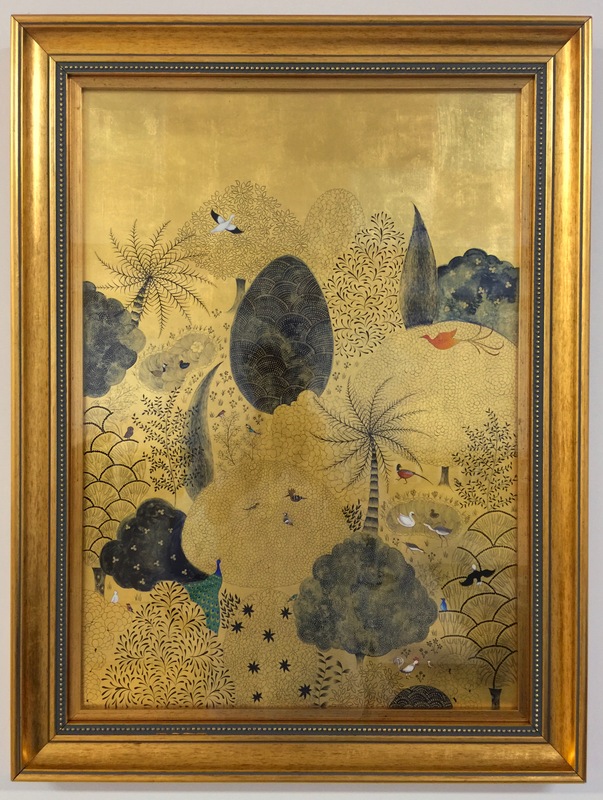 Indigo, shell gold, and pigments on gold leaf. 'Ayat Al-Kursi' (c) Ayesha Gamiet, 2017. Shell gold, gouache, and inks on handmade paper. Allah. There is no god but He,-the Living, the Self-subsisting, Eternal. No slumber can seize Him nor sleep. His are all things in the heavens and on earth. Who is there can intercede in His presence except as He permitteth? He knoweth what (appeareth to His creatures as) before or after or behind them. Nor shall they compass aught of His knowledge except as He willeth. His Throne doth extend over the heavens and the earth, and He feeleth no fatigue in guarding and preserving them for He is the Most High, the Supreme (in glory). 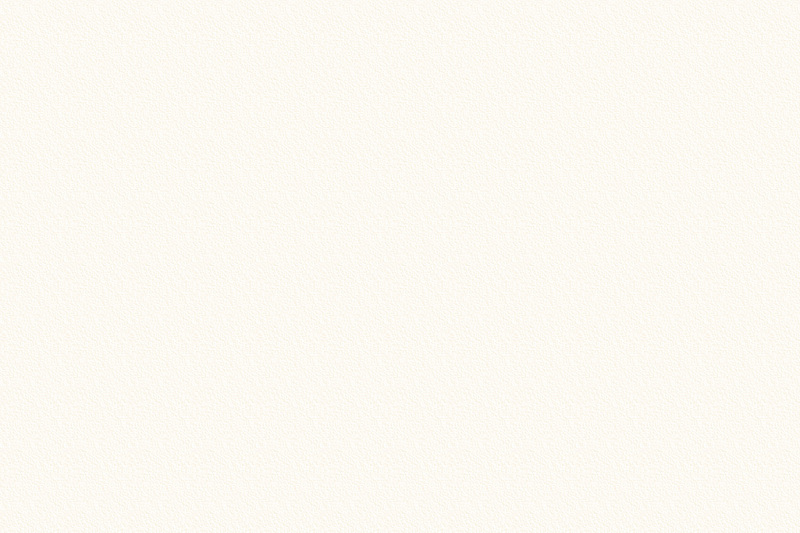 Translation by Abdullah Yusuf Ali. 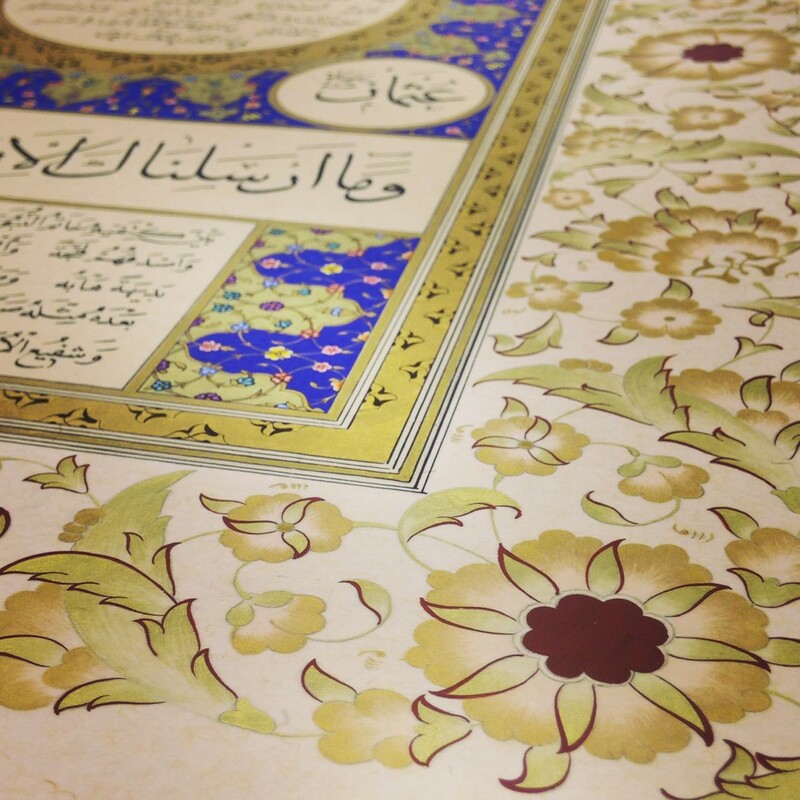 Calligraphy by Sabah Arbili. 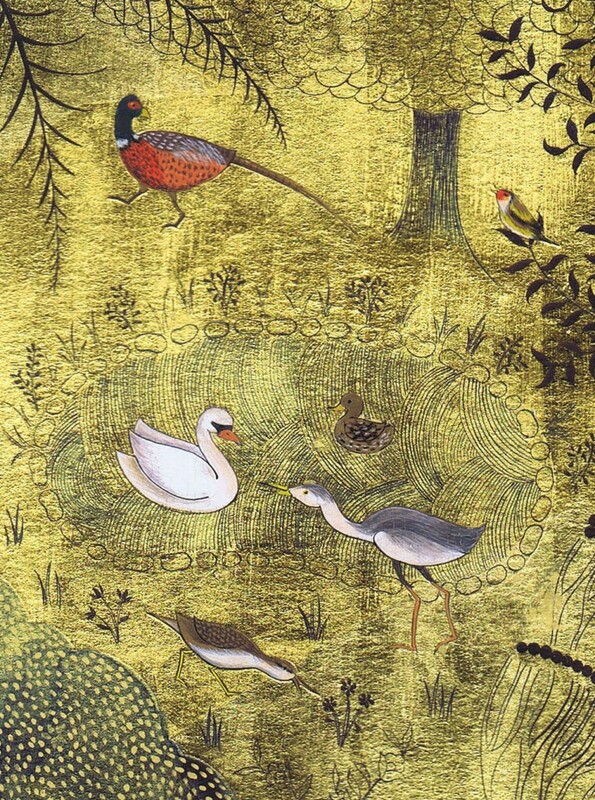 I’ve written about the story behind this illuminated painting in a previous blog post. Those of you who follow my blog will know that the calligraphy is one of my parents’ favourite verses from the Qur’an, and that I made this painting as a gift to them to thank them for their love and support throughout my education and career. and to be firm and patient, in pain (or suffering) and adversity, and throughout all periods of panic. Such are the people of truth, the Allah fearing. Persian miniature painting (c) Ayesha Gamiet, 2017. Gold leaf, shell gold, and pigments on stained and sized watercolour paper. And finally, this is my latest Persian miniature. 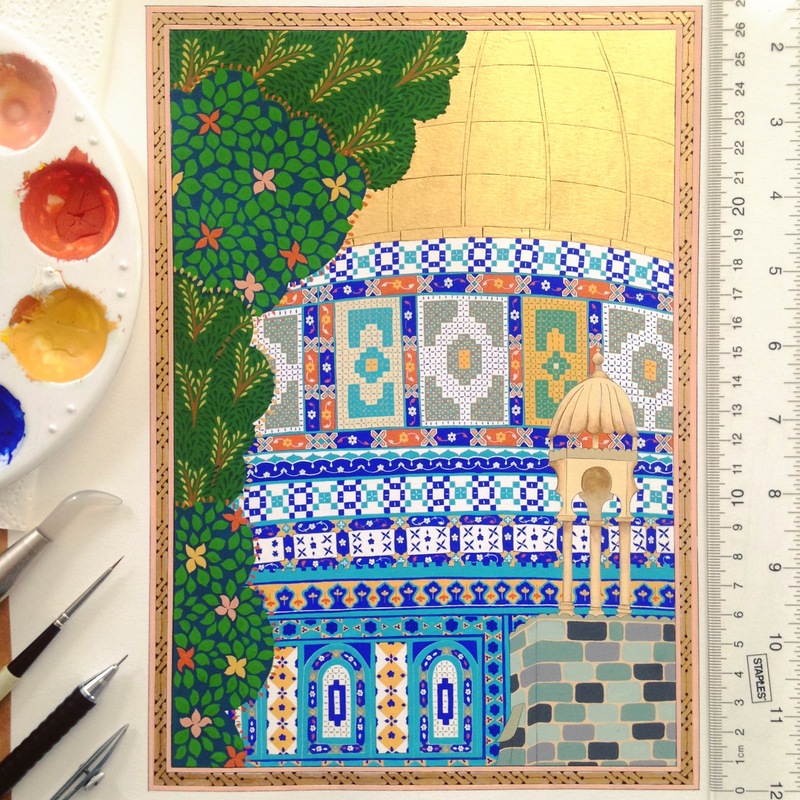 I was interested to explore pattern and colour in Persian miniature architectural forms. I also really enjoyed using proportional rectangles to help create the composition for this piece. I hope you enjoy the work! 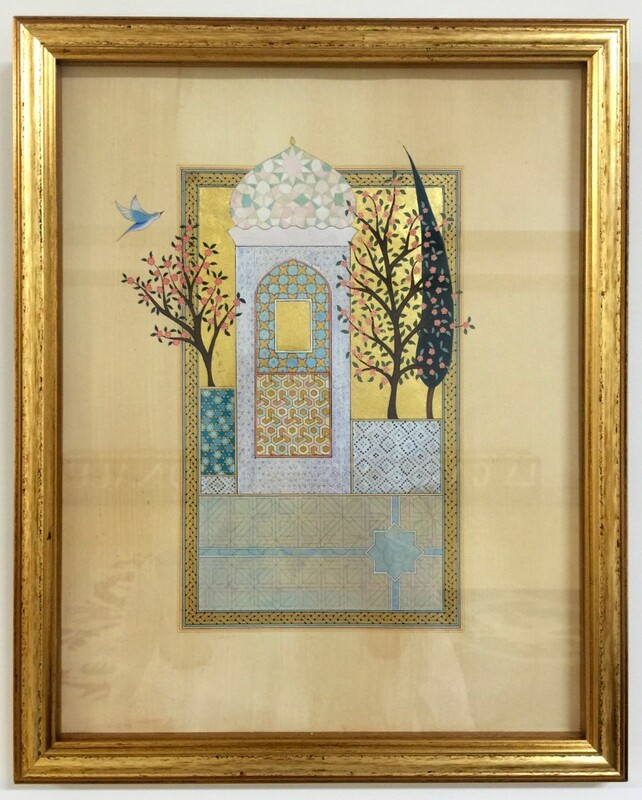 ‘One Song’ and my Persian miniature painting are both for sale. Please get in touch via the contact form on my website if you are interested in purchasing or commissioning a work. 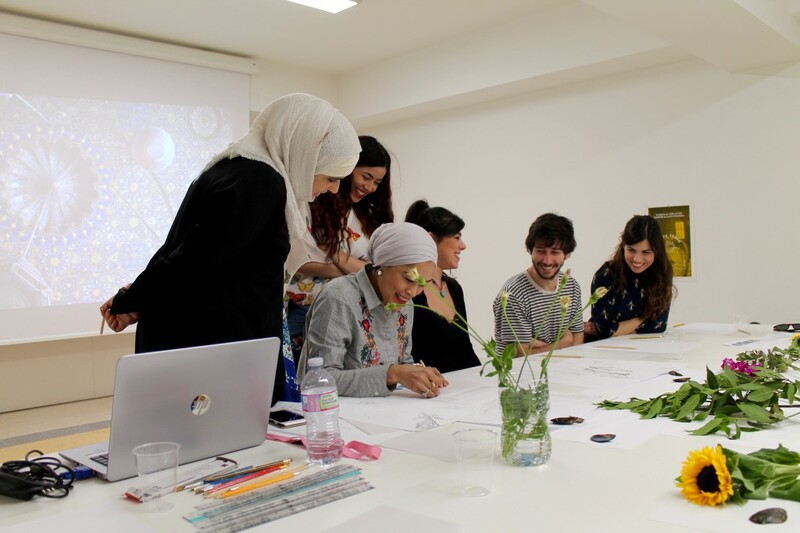 Last month, I spent a week in Rome delivering workshops with Una Moschea Per Roma, and my friend and colleague Shaheen Kasmani. The workshops took place at La Galleria Nazionale, who also invited me to exhibit some artwork for the duration of the month-long series of events. This was a really interesting project, intended to appeal to people of diverse cultural and religious backgrounds in Rome, opening up a space for discussion about sacred spaces in the city. 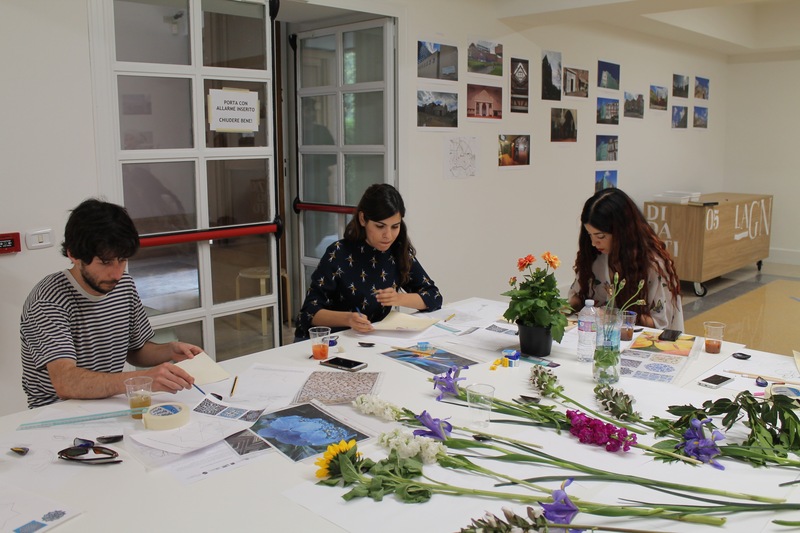 As well as the exhibition and workshop, events included three public forums where visitors discussed their views on sacred spaces for religious minorities in Rome, a photography exhibition, plus several poetry / spoken word sessions. For more information about the project, take a look at Una Moschea’s Per Roma’s page. 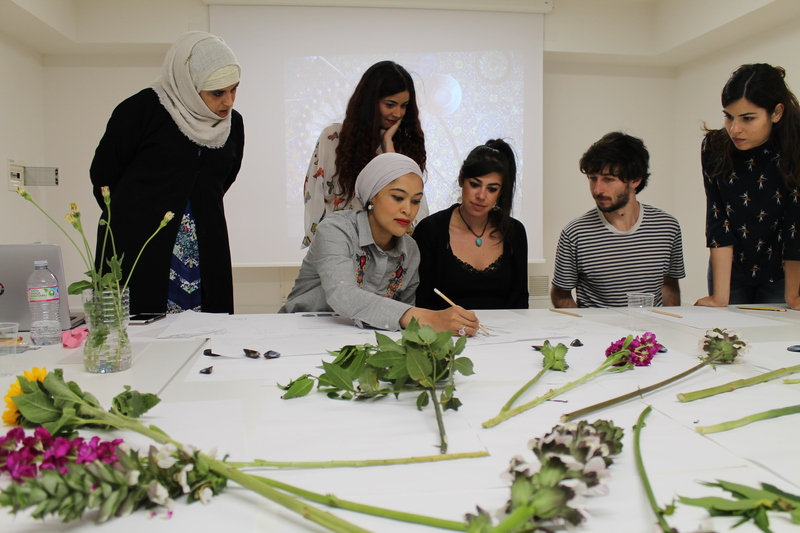 Students learn about Islamic pattern by linking traditional floral motifs to their origins in the natural world. Drawing from nature in the gallery gardens. Back in the classroom, students paint their designs. I’ll update with pictures from my exhibition in a separate post… keep an eye on the blog for more stories about my travels these past few months! It’s been busy! In 3 months, I’ve worked in Cairo, Rome, and Istanbul, very exciting! But it’s also nice to be back home and settled in my studio, doing what I love most – painting! 'One Song' (c) Ayesha Gamiet 2017. Inspired by a poem by Jalaluddin Rumi. 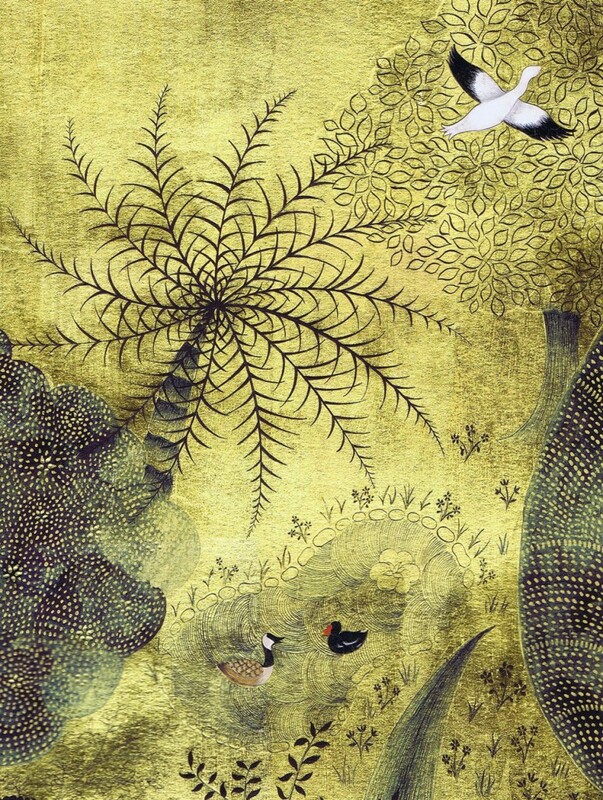 Gold leaf, pigments, and gouache on paper. My latest artwork is inspired by these beautiful lines from Rumi. Scroll down to see a couple of details from the main painting. This was originally meant as a commission for a client, but unfortunately, their budget did not stretch to new artwork. Inspired by Rumi’s poetry, I decided to paint the piece, anyway. I’ve been longing to illustrate Rumi’s verses for some time now, and this seemed like the perfect opportunity. ‘One Song’ detail (c) Ayesha Gamiet 2017. Inspired by a poem by Jalaluddin Rumi. 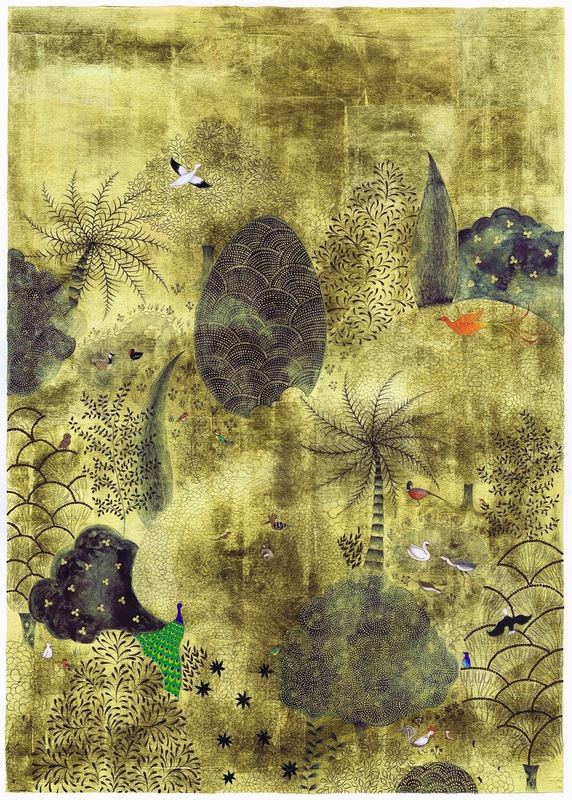 Gold leaf, pigments, and gouache on paper. 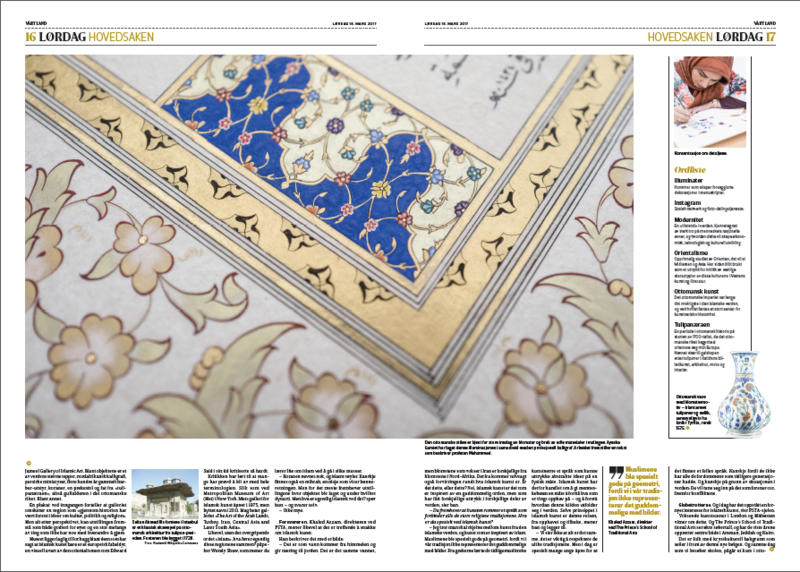 Many thanks to Heidi Marie Lindekleiv of Norwegian daily Vårt Land for this beautiful and insightful article on the revival of Islamic arts in Europe. Last month, Heidi interviewed Khaled Azzam from the The Prince’s School of Traditional Arts, and myself. I was teaching one of my Islamic art courses in London at the time. Heidi spoke to me and the students about our interest in Islamic art – why do we practice it, and what does it bring to our lives? She also explored the role of social media in popularising this art. If you’re not a Norwegian speaker, try copying and pasting a few paragraphs into google translate, like I did. Or at least enjoy the photos of our classes and the artwork, which are wonderful. Do I have any Norwegian speaking followers who might be able to give us a short summary, or a translation of the article? If so, send me an email, or leave a note in the comments below. Great news! I have just been featured on the Islamic Fashion and Design Council‘s website! The article discusses the inspiration and background to my art, as well as the influence of my travels and teaching. Click here to read the full article.